Deborah L. Cox was born in Charleston, North Carolina on July 12, 1961. She entered Heaven’s gates on January 24, 2017. Ms. Cox passed away Tuesday, January 24, 2017 at the Jackson Memorial Hospital, in Miami. Deborah received her Licensed Practical Nursing degree from Lindsey Hopkins Technical Education Center. She worked as a LPN at Jessie Trice community Health Center for more than 15 years. Deborah had an unwavering faith in God Ms. Cox was a member of New Birth Baptist Church and was an active member of the nursing ministry. 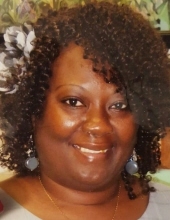 She was preceded in death by her mother; Olive Brown-Walton, Richmond Hill, Ga. She left to mourn, her two children; Shevonne Jones, Miami, Fl, and Saquoia Cox, West Springfield, MA;Two stepsons Demetrice Cox (Nicole) , Cutler Ridge, Fl and Jackson Pinder, Cutler Ridge, Fl . Two loving grandchildren; Traivon Ferguson, Miami, Fl and Jaisean Jones Miami, Fl 2 sisters, Lavern Ferguson and Wanda Monroe; 2 brothers, Anthony Ferguson, and Mervin Mcphee. As well a host of nephews, cousins and love ones. To plant a tree in memory of Deborah L. Cox, please visit our Tribute Store. "Email Address" would like to share the life celebration of Deborah L. Cox. Click on the "link" to go to share a favorite memory or leave a condolence message for the family.